This report from April 2014 contains in-depth data about Erste Group and its operations and markets. It contains a company overview, business and strategy description, financial ratios, valuation & forecast data, SWOT analysis, plus data on key events. This report has been published in April 2014 and contains in depth information and data about Erste Group and its operations and markets. It contains a company overview, business and strategy description, financial ratios, valuation & forecast data, SWOT analysis, plus data on key events. FriedlResearch is a Vienna based market research company, which helps foreign investors, corporate executives and financial professionals to understand the dynamic markets and companies of Austria and the Central- and Eastern European countries Bulgaria, Croatia, the Czech Republic, Hungary, Poland, Romania, Russia, Slovakia, Slovenia and the Ukraine. 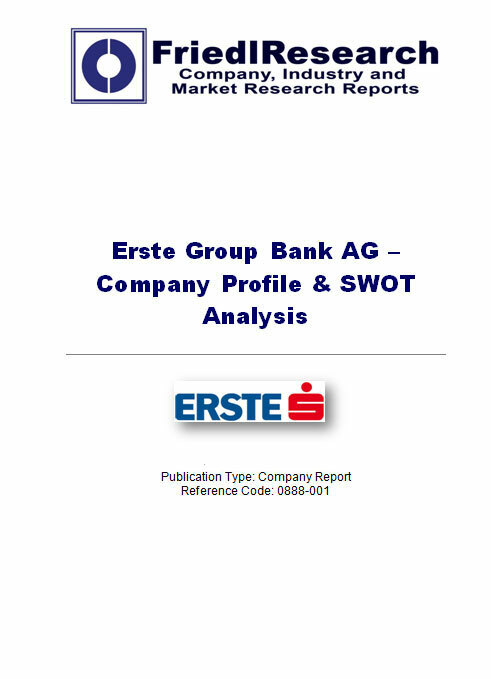 FriedlResearch’s "Erste Group Bank AG - Company Profile & SWOT Analysis" contains in depth information and data about the company, its markets and its operations. - plus information on key corporate actions and events affecting the company. • Studies and presents the company's strengths, weaknesses, opportunities (growth potential) and threats (competition). From a strategic point of view, Erste Group is highly dependent on the economic development in the CESEE region. In meantime, the worst is over now in the CESEE. In Romania and Hungary, the economy is growing again. The Czech Republic is expected to return to growth in 2014. The recession in Slovenia and Croatia is projected to end in 2015. In the medium term, the frame conditions will remain tense. In CESEE, though. Most challenges could be managed by Erste Group. Despite enormous macroeconomic and market difficulties, Erste Group could improve its capital ratio and could absorb write-offs in foreign markets. In the next quarters, Erste Group faces slightly stagnating results. Due to several reasons, the banking group´s profitability will remain under pressure. • First, the low interest rate and the small interest margins cause a decrease in the net interest income. Due to the extremely loose monetary policy, a trend reversal is not in sight yet. • Second, the lending growth will be very modest. Private households and companies remain cautious and continue to deleverage. Only in the Czech Republic and in Austria, Erste Group registered a small lending growth this year. • Third, although the peak has been left behind, loan loss provisions for bad debt remain high. Apart from Hungary, risk provisions are going down. The decrease in loan loss provisions will be more than offset by lower operating income. • In the next years, Erste Group must improve its asset quality in order to retain confidence of the financial markets. Erste Group will take years to bring the NPL ratio down to the pre-crisis level. • Moreover, the economic uncertainty and the unpredictable market conditions in Hungary are further downside factors. • In the next quarters, Erste Group is forced to continue the strict cost management. CEO Andreas Treichl has repeatedly explained that Erste Group will continue its austerity program. For Erste Group, the medium-term outlook is more promising than the short-term outlook. After 2015, Erste Group has good prospects to record substantially higher profits. As the lending activity is pegged to the deposits, Erste Group will not record the same dynamic growth rates as in the years before 2008. • First, the economic frame conditions are expected to improve. As soon as the CESEE region returns to robust growth rates, Erste Group will be one of the first beneficiaries. • Second, significant lending growth and an increase in net interest margins are likely. • Moreover, Erste Group´s asset quality will improve slowly, but steadily in the course of the next years. • Slovakia, Austria and the Czech Republic will remain Erste Group´s core pillars in terms of net income. In Slovakia and in the Czech Republic, the growth potential is not exhausted yet. • In addition, market uncertainties will disappear gradually. Until 2015, the banking crisis in Hungary will be solved. Already in 2013, Hungary´s economy returned to growth. • Finally, Romania has good prospects to become Erste Group´s most profitable market. For Erste Group, the Romanian market has the highest growth potential. In the medium term, Romania will become the most important growth driver. The upward potential is limited, though. Unlike its Austrian competitors RBI or UniCredit Bank Austria, Erste Group did not manage to enter the markets in Poland and Russia in time. In Ukraine Erste Group had to withdraw again. Hence, three major markets are missing in Erste Group´s map. In Poland, there are no acquisition targets in sight yet. Potential takeover targets are currently valued rather high. As a consequence, a market entry in Poland will not take place before 2015. Anyway, the banking group does not have enough resources to start another bigger expansion step. In Southeastern Europe, the takeover of medium-sized takeover targets is more likely, though. Erste Group considers taking over certain units of the publicly held Hypo Group. In order to improve its organic growth potential, Erste Group will have to cut the pay-out ratio.